In today's economy, many parents are concerned about affordable homeschooling. However, even families who are on tight budgets can teach their children at home using these tried and true strategies for inexpensive homeschooling. Look for used homeschool books and affordable homeschooling curriculum at discount book stores, used book stores, thrift stores, and garage sales. Here are some sources of discount homeschool books. Here are some places to buy and sell used curriculum. Here are some tips for buying used homeschool textbooks. Here are some tips for selling used curriculum. Search the internet for free homeschooling materials, games and worksheets. There are some great texts available in their entirety online. Here are some sources of free homeschool curriculum. Here are some other places to find free homeschooling curriculum. Use a free cyber school, charter school or public school at home program. Here are some of the advantages of using a virtual school. Here are some of the disadvantages of virtual homeschooling. Here are some additional sources of free online homeschooling. As a homeschool parent, you are your child's teacher. Ask the managers of your favorite stores if they offer a teacher's discount. Here's a list of retailers that offer homeschool discounts, as well as information about where you can obtain a free homeschool ID card. Purchase materials at a homeschool curriculum fair in order to save money on shipping and receive show discounts. Some curriculum suppliers, such as A Beka, sponsor hotel meetings where you can view samples and purchase materials without paying shipping fees. As you can see, there are many ways to make homeschooling affordable. Here are other ways you can lower your homeschooling costs. 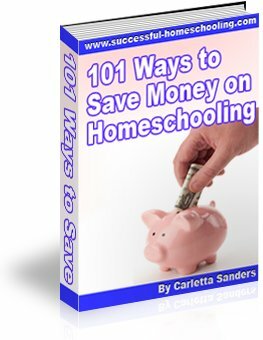 In addition to finding affordable homeschooling materials, families can save money on homeschooling by trimming other areas of their budgets and finding ways to earn extra income. Many companies offer alternative work arrangements such as telecommuting, job sharing or flexible work schedules that make it possible to work and homeschool. Here is some information about opportunities for work at home moms, along with a description of my work at home journey.